Sooke's salmon fishing has been pretty decent of late. The summer pattern has begun, with fish reported at Trap Shack, Secretary Island and Possession Point, and Otter Point. There are some slow days, but there are also some really nice fish being caught...as they say "your trophy is out there" somewhere. 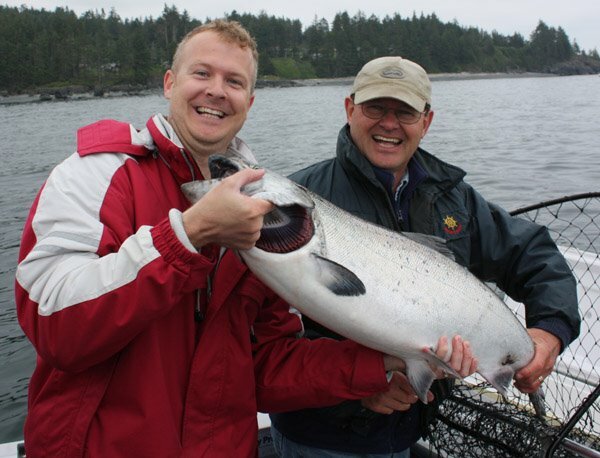 Colin from Toronto caught a nice 29 pounder, his first salmon ever, fishing with Neil from Salty Towers Resort. June 3: Fished at Sheringham today from 6am to 9am, had a teenager on by 6 11am and the old man lost it at the side of the boat. Purple hot spot and jdf purple haze head, 61ft in 65ft of water. Landed a teenager around 830am, Betsey and bloody nose head, 8 ft leader same depth. Only 1 other boat there and didn't see anything else, had 1 other bite. Moved down and fished Possession from 930am to 12pm, landed a 10 lber off the front corner of Secretary at 10 20am, 66ft in 140 ft of water. Lots of crap in the water made for hard fishing, saw 2 fish caught in the bay on the west side of Possession. 1 was lost and 1 was giving a solo fisherman a hard time, that was at 11 35am." June 8: You ever have a day when everyone is catching fish around you but you cannot hook on to save your life, that was my Sat, snap! Fished Possession Point on Sat. from 6am to 12pm, saw a slow trickle of fish getting caught all morning, saw quite a few caught off Secretary. One guy fishing solo was tubbed out by 7am fishing tight off the west side of Secretary. We had 1 bite at 10am off Possession and that was it for us. Went back out from 4 to 630pm, zero. Fished more off the harbour mouth, lots of bait boiling, saw Reel Excitement pick up 2, other then that it seemed a lot quieter than the am shift. Sunday was better for us, fished from 6am to 12pm, hooked 1 at 11am off the point of Possession, 80ft, purple hot spot, purple haze head, 5 ft leader. Next pass hooked another 76ft, Betsy flasher and bloody nose head, 6ft leader. One shook the hooks beside the boat and one was mainlined, F#$% me !!! No I was not on the rods! Lots of fish hitting the table on Sun. but Possession was not as good as Sat., counted 45 boats Sun. and everyone was spreed out trying to find'em. More fish were coming from between the harbour mouth and Possession on Sun, Bob from 2 Reel had 4 in the boat, lots of bait. Saw a 36lber at the cleaning table which was caught at Otter at 7am, the guys that caught it had one other small one and a bite but said it was not hot and heavy up there, saw very few nets out. Back out soon good luck to all!!" Thanks for all the details and good info Ryan! Crabbing is still excellent in Sooke Harbour, with big Dungeness crabs and lots of them.